Internet of things is the new topic which is trending a lot nowadays. It basically means connecting everything to the grid i.e Internet so that we can monitor or control things without any restriction. So a company named Cube26 has launched their new smart bulb under the branding REOS which was previously called IOTA. REOS lite LED smart bulb can be controlled directly from your smartphone and has millions of color options to choose from. So let us do REOS lite LED smart bulb full review to find out if it is really that smart. The new design of the REOS smart bulb is quite different from the previous IOTA bulb. It is now much wider at the top and slim as we move towards the bottom. With all the added smart features, it is heavier than your traditional bulb at home. You may need a connector if you live in India, which comes free with the bulb. The build quality is good and it is available in only white color. 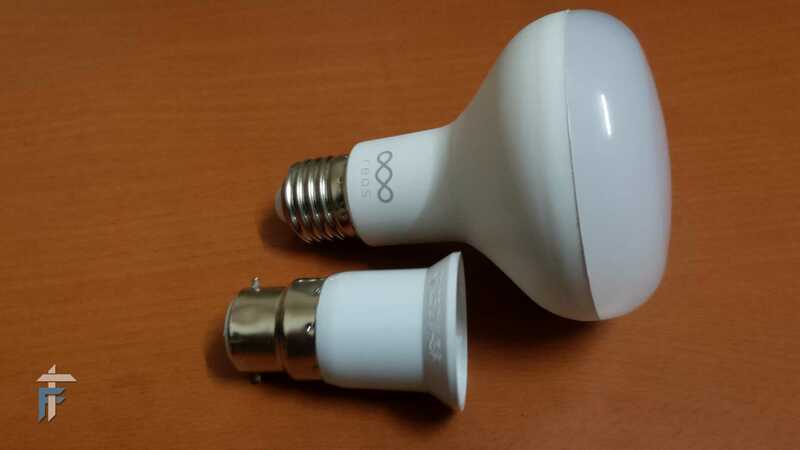 How to connect to REOS lite LED smart bulb? REOS smart bulb uses bluetooth(4.0+) for the connection. Currently, the app for REOS smart bulb is available on Android and iOS platforms only. Download links are given below. Connect and switch ON the bulb from your switchboard. Turn ON the bluetooth and GPS. You will need to enable GPS for the bluetooth pairing as it is now mandatory after the Android 6.0 update.This is the reply that I got from Cube26 regarding the GPS issue: From Android 6.0 (Marshmallow), Android SDK makes it mandatory for all BLE connections to have location access. It has nothing to do with Reos Lite App. Anyone using any BLE device with Android 6.0 or higher will have to give location permission. He will have to do the same thing with fitbit or any other wearable. Launch the app Reos lite and then search for the bulb. After you find it, you can rename it. Also, set it to auto-connect so that every time controlling the bulb is much easier. Now you can try changing the color, intensity and the modes of the bulb. If you face any problem, then restart the bulb from the switchboard and do the same thing with the app too. You must be wondering only the connectivity with smartphone is the smart feature we were referring to, but no. There are other features that make this bulb smart. You can almost choose any shade of any color from the two default palettes. Out of the two, one palette has multi-colors and the other just has two shades of white that are orange(warm) and blue(cool). Apart from that you can also pick up color from your background by taking a picture and making your own palette. Apart from this you can also set your favorite color using Voice commands. There is an option to change the intensity/brightness(Max – 1100 Lumes) using the slider. This is a very nice feature with ready made music syncing option available that works just great. You will need the Reos Music app for the synchronization to work smoothly. Using this mode you can make the bulb dance with multi-colors on the beats. The intensity of light increases and decreases according to the music volume. Default music can be replaced by using the audio input from microphone. There are various default modes like Kaleidoscope, Strobe, Candle, Christmas, Reading, Party and Movie. All the modes have different color options and light intensity depending on the ambience you want. If you are not satisfied with the default mode, you can also create your own custom mode. Now this is a very cool feature which was totally unexpected when I got the bulb for review. Reos lite LED smart bulb is also capable to notify you of any incoming calls,SMS or notifications from Whatsapp, Facebook(you can define it for specific person or action). It also tells you if your pizza or your cab has arrived. The apps supported in the current version of Reos are Youtube, Weather, Whatsapp, Hike, Ola, Uber, Facebook, Tinder, Domino’s, bigbasket, Grofers, and Swiggy. We are expecting more apps in the future. The notification methods include Fade In, Fade out, Candle Flicker, Strobe, & Kaleidoscope. Reos lite smart bulb can also be scheduled to turn ON or OFF between certain time period. You can also set a timer for the same action. For example, if you wish to turn On the bulb every day at 7PM-11PM in the evening after the sunset. Want to try out the app features before you buy the bulb? You can do this using the virtual mode. Just download their app and visit this website. Scan the code and then try out the various features of the bulb on a web page. The REOS lite LED smart bulb is available for Rs.1699 on Flipkart. You get 1 year warranty for this smart bulb. So this was the REOS lite LED smart bulb full review. There are still a few bugs in the app which are constantly being fixed by the company with the new updates. Many features will be pushed in the coming future. This is something that I would recommend getting as your first Internet of things product. There are other companies like Syska making smart bulbs but currenty REOS is the clear winner. Let us know what you think about these new smart products in the comment section below, doubts/feedbacks are welcome too.